The quest for developing the scalable methods of synthesis of materials with potential electrochemical energy storage applications remains a great challenge. Herein, we propose a facile, one-step chemical precipitation method for the synthesis of Bi2S3 with the nanorods morphology. Influence of different synthesis temperatures on the physical, chemical, and electrochemical performance was investigated. Relatively low BET surface area and mesopore volume of Bi2S3 increased with the higher reaction temperature. Bismuth sulfides synthesized at various temperatures were used as an electrode active material in supercapacitor. 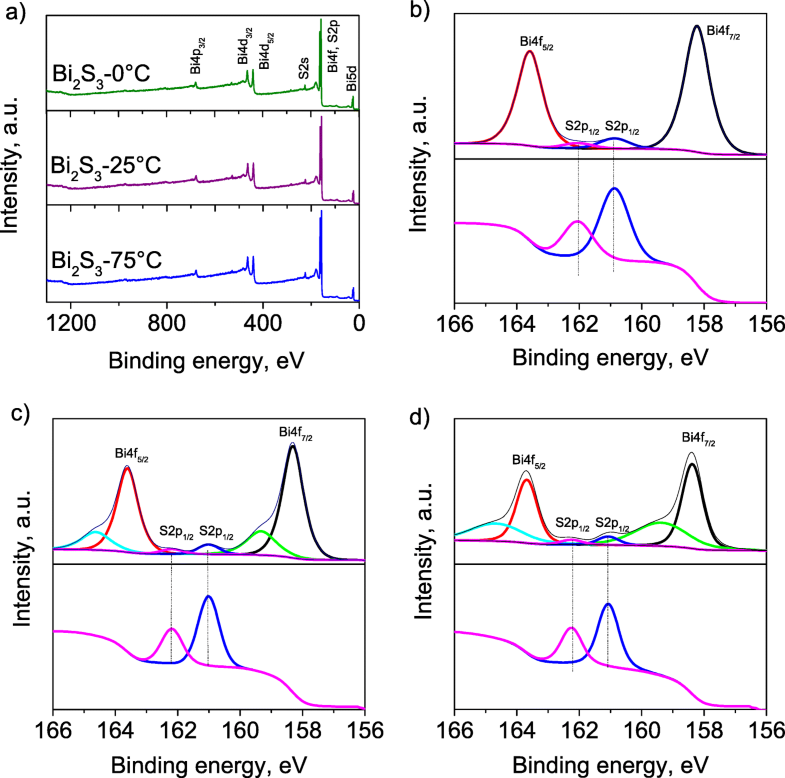 The semiconductive properties of Bi2S3 resulted in exceptional capacitive behavior. Bismuth sulfide synthesized at 75 °C exhibited a specific capacitance of 457 F g−1 at 1 A g−1 in 6 mol L−1 KOH solution as an electrolyte. Moreover, material prepared at 75 °C maintained the best capacitance value at a large current density of 20 A g−1, compared with bismuth sulfides synthesized at the temperatures of 0 °C and 25 °C. The online version of this article ( https://doi.org/10.1007/s10008-019-04215-7) contains supplementary material, which is available to authorized users. In the last decade, extensive efforts have been undertaken to develop new generation energy storage devices with high power and energy densities for the application in hybrid electric vehicles and portable electronics. Supercapacitors are considered as promising candidates for harvesting and delivering relatively high amount of energy in short periods of time, showing excellent reversibility and long life performance. Besides the carbon materials such as activated carbons, carbon nanofibers, or graphene oxides [1, 2, 3, 4, 5, 6, 7, 8], transition metal compounds such as metal oxides or/and hydroxides are considered as attractive potential electrode materials for use in supercapacitors due to the high-capacitance values, which convert into the enhanced energy density [9, 10, 11]. Transition metal sulfides have been nowadays great candidates for use in hybrid supercapacitors due to their strong faradaic electrochemical response. Among various metal sulfides, nickel sulfide [12, 13], cobalt sulfide , nickel cobalt sulfide [15, 16], bismuth sulfide , and copper sulfide  have received considerable attention as an electrode active material with high pseudocapacitance for supercapacitors. Among aforementioned metal sulfides, Bi2S3 has drawn special attention due to the unique electric properties resulting from p-type semiconductor behavior with direct band gap (Eg) of ~ 1.3 eV . These extraordinary features encourage further investigations of Bi2S3 in energy storage applications. 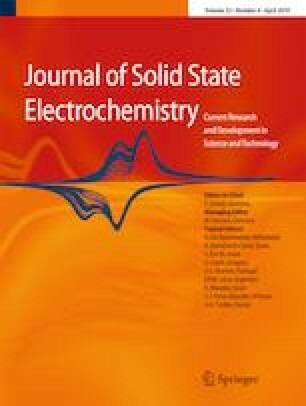 Several synthesis methods of nanosized bismuth sulfide have been reported, such as electrochemical deposition , sonochemical techniques , or microwave irradiation . However, the most recently used method for Bi2S3 synthesis is hydrothermal (solvothermal) treatment [22, 23] which requires using thioacetamide, thiourea, l-cysteine, or sulfur sublimed at high temperature [24, 25]. Liang et al. synthesized Bi2S3 in the nanorods form by the solvothermal method and used it as electrode-active material in supercapacitor, obtaining 270 F g−1 at a current density of 1 A g−1. The hierarchical Bi2S3 nanoflowers synthesized via hydrothermal method by Liu et al. were characterized by the capacitance value of 233 F g−1 at 1 A g−1. In order to improve the supercapacitor performance, the Bi2S3 nanorods–graphene composite was synthesized by Vadivel et al. resulting in a composite which exhibited a maximum specific capacitance of 290 F g−1 at a current density of 1 A g−1. Compared with many other reported bismuth sulfide synthesis methods, which involve hydrothermal or solvothermal procedures, the proposed precipitation approach exhibits several advantages. The use of ammonium sulfide solution with a bismuth nitrate offers a cost-effective procedure for preparation of Bi2S3 nanostructures without use of sealed autoclaves and high synthesis temperatures. The proposed synthesis route stands out in terms of the synthesis time, which is several times faster compared with hydrothermal procedures and can be successfully applied in the larger scale without additional costs. Moreover, due to the simplified synthesis method, various modifications of the procedure parameters may be applied in order to adjust the electrochemical properties of bismuth sulfide nanostructures. Herein, a facile chemical precipitation of bismuth sulfide as a novel approach for synthesis of Bi2S3 is proposed. We have evaluated the synthesis temperature as a factor influencing Bi2S3 physical and electrochemical properties. As-received bismuth sulfide nanorods were used as an active material of the electrode and exhibited a remarkable capacitance value of 457 F g−1 at 1 A g−1 when synthesized at 75 °C. Bismuth sulfides were synthesized using a facile chemical precipitation at 0, 25, and 75 °C. 1.9 mmol of bismuth nitrate (Bi (NO3)3∙6H2O) was dissolved in distilled water. The solutions were adjusted to a set temperature (0, 25, and 75 °C) under vigorous mechanical stirring. Subsequently, the solution of ammonium sulfide ((NH4)2S) was added dropwise until precipitation of bismuth sulfide was complete. The resulting bismuth sulfides were washed several times with distilled water followed by centrifugation until the neutral pH of the solution is dried under a vacuum at 60 °C for 24 h.
The porous texture characteristics of the materials were determined by N2 sorption at 77 K using a NOVA 2000 gas sorption analyzer (Quantachrome). Prior to measurements, the sample was outgassed overnight at 120 °C. The specific surface area (SBET) was calculated from the Brunauer–Emmett–Teller (BET) equation. The amount of nitrogen adsorbed at a relative pressure of p/p0 = 0.96 was employed to determine the total pore volume (VT). The micropore volume (VDR) was estimated from the Dubinin–Radushkevich equation. The mesopore volume (Vmes) was determined as the difference between the total pore volume and the micropore volume. The morphology of the bismuth sulfides was analyzed by field -emission scanning electron microscopy (FESEM, Merlin Zeiss) with an accelerating voltage of 3 kV. Transmission electron microscopy (TEM) images were recorded on TALOS F200X apparatus operating with an accelerating voltage up to 200 kV. The crystalline characteristics of the materials were studied by X-ray diffraction analyzer (XRD, Ultima IV, Rigaku) equipped with a 2 kW X-ray tube (40 kV/30 mA) using Cu Kα2 radiation (λ = 1.54056·10−10 m). The chemical composition of resultant bismuth sulfides was analyzed by X-ray photoelectron spectroscopy (XPS) using a PHI 5000 VersaProbe (ULVAC-PHI) spectrometer. The best peak fits were obtained using a Gaussian–Lorentzian (70/30) peak shape at the same FWHM for all fitted peaks. The electrodes were composed of 80 wt.% of bismuth sulfide, 10 wt.% of polyvinylidene fluoride (PVDF), and 10 wt.% of carbon black as an active electrode material, binder, and percolator, respectively. The electrodes were pressed in the form of pellets with a geometric surface area of 0.9 cm2. For electrochemical measurements, three-electrode configuration was assembled in a Swagelok system. The measurements were performed in 6 mol L−1 KOH aqueous solution using gold current collectors to avoid corrosion and to preserve comparable experimental condition. Measurements were conducted with a potentiostat–galvanostat VSP Biologic in a voltage range of − 0.8 ÷ − 0.2 V. The electrochemical properties of Bi2S3 samples were determined by cyclic voltammetry at a voltage scan rate of 1–100 mV s−1 and galvanostatic charge–discharge at current densities in the range 0.2–20 A g−1. The specific capacitance was expressed in farads per mass of active material in one electrode. The specific capacitance values (C/F g−1) were calculated from the galvanostatic discharge curves and the CV curves using Eqs. (1) and (2), respectively. where C is the specific capacitance of the electrode (F g−1), U is the potential window (V), and t is the discharge time (s). Porous structure of synthesized bismuth sulfides was determined by N2 sorption at 77 K. The hysteresis loops occur in all samples regardless of synthesis temperature, confirming mesoporous nature of Bi2S3, Fig. 1a. Obtained bismuth sulfides were characterized by the poorly developed BET surface area in the range 11–18 m2 g−1. The structural parameters of obtained samples are included in Table 1. The lowest VT and Vmes of 0.031 cm3 g−1 and 0.027 cm3 g−1, respectively, were noticed for sample synthesized at lowest temperature (Bi2S3-0°C) and characterized by the lowest surface area of 11 m2 g−1. However, within the range of temperatures from 0 to 75 °C, it is clearly seen that the porous texture of Bi2S3 is more developed when the synthesis temperature increases. The sample obtained at 75 °C is characterized by the almost twice higher total pore volume and approximately three-fold higher mesopore volume compared with Bi2S3 synthesized at 0 °C. The XRD patterns (Fig. 1b) presents very similar crystalline phase for all bismuth sulfides, which indicates that the synthesis temperature does not affect the crystalline structure. The diffraction peaks correlate with Bi2S3 orthorhombic phase. The diffraction planes were assigned in an agreement with standard diffraction pattern of Bi2S3 (JCPDS 65-2435). No impurities and Bi2O3 phase were noticed in the materials synthesized via proposed precipitation method with ammonium sulfide. In order to receive a deeper insight into characterization of bismuth sulfides, XPS analyses were conducted. The survey spectra presented in Fig. 2a reveal signals assigned to bismuth and sulfur. The high-resolution XPS spectra of Bi 4f and S 2p were explored in order to determine the chemical state of bismuth sulfides, Fig. 2b–d. The most intensive peaks in the Bi 4f region at 163.6 and 158.3 eV are pertaining respectively to Bi 4f5/2 and Bi 4f7/2 in Bi2S3 . The sample synthesized at 0 °C is characterized by the nearly symmetric shape of peaks confirming pure phase of bismuth sulfide on the surface of an analyzed material, Fig. 2b. In case of samples obtained at 25 and 75 °C, Fig. 2c and d, some distortions on shoulders of Bi 4f7/2 and Bi 4f5/2 peaks indicate heterogeneous composition of bismuth sulfide surface. Two extra peaks in the Bi 4f region at the energy binding of 164.7 and 159.4 eV can be ascribed for appearing bismuth oxide. The increase of the Bi2S3 synthesis temperature results in a formation of residual quantities of bismuth oxide on the surface, which finds the confirmation with the rise of the intensity of bismuth oxide peaks in the samples synthesized at 25 and 75 °C. However, according to the XRD results of analogous Bi2S3, the appearing traces of the oxidized form of bismuth in the samples Bi2S3-25°C and Bi2S3-75°C are present only on the surface of materials. The magnified region of S 2p for all samples reveals the peaks of S 2p3/2 and S 2p1/2. The more intense signal recorded at 161.1 eV is ascribed to S 2p3/2 and the peak with lower intense located at energy binding of 162.2 eV is assigned as S 2p1/2. These doublet signals confirm the primary valence state of sulfur as S2− . The typical morphology of obtained bismuth sulfides is shown in Fig. 3. The nanorod form of Bi2S3 is recognized in all three samples regardless of synthesis temperature. Less aggregated Bi2S3 nanorods synthesized at 75 °C may influence a slight development of the specific surface area determined by N2 sorption. Higher temperature leads to longer Bi2S3 nanorods, with more defects and small aggregates on the surface as the temperature increases, which can be explained by vigorous aggregation of the bismuth sulfide nanorods and accelerated collision between nucleation atoms during precipitation process . The length of Bi2S3 nanorods can exceed even 5 μm, while the diameter is approximately in the range of 100–200 nm. The bismuth nitrate and ammonia sulfide used as a Bi3+ and S2− source in the water solution promote the form of nanorods due to the inherent Bi-S chain type structure . TEM images of bismuth sulfides present the nanorod-like form, which correlates with the FESEM observations (Fig. 4). Furthermore, TEM analysis revealed the presence of the secondary structures, recognized as thin films of a spherical nanoparticles on the external surface of Bi2S3 nanorods. The diameter of these nanoparticles does not exceed 20 nm, Fig. 4b. At the higher synthesis temperatures, larger amounts of these nanoparticles are distributed on the bismuth sulfide nanorods, Fig. 4c. The presence of the spherical nanostructures can provide additional electrochemically active redox sites at the electrode/electrolyte interface and increase the ratio of surface sites to the bulk sites . The faradaic peak between − 0.7 and − 0.8 V represents the cathodic adsorption of hydrogen in the lamellar structure of the Bi2S3 nanorods . For bismuth sulfide obtained at 75 °C, the additional cathodic peak at − 0.32 V is noticed, which is related to the hydrogen oxidation during electrochemical measurements . This phenomenon suggests that during reduction, the hydrogen is stored within Bi2S3 structure via chemisorption interactions . Bi2S3-75°C was characterized by the outstanding capacitance value of 739 F g−1 at 1 mV s−1, achieving higher value than Bi2S3-0°C and Bi2S3-25°C (527 and 552 F g−1, respectively), Fig. 6a. When the scan rate is higher, the capacitance value decreases regardless of bismuth sulfide synthesis temperature. Lower currents registered for samples at 0 and 25 °C compared with Bi2S3 from 75 °C at higher scan rates indicates that bismuth sulfides synthesized at lower temperatures exhibit higher internal resistance values, which manifest as a significant capacitance fade. For bismuth sulfide synthesized at 75 °C, the highest capacitance value was maintained, achieving 194 F g−1 at 100 mV s−1, while the capacitance values of Bi2S3-0°C and Bi2S3-25°C were only 94 and 162 F g−1, respectively. The enhanced electrochemical performance of Bi2S3-75°C might be ascribed to the presence of superficial nanoparticles on the Bi2S3 nanorods, which increased the ratio of surface sites to bulk sites. These nanoparticles distribute the energy level of the redox sites over a wider potential, which broadens the faradaic peaks observed on the voltammogram As a result, there is less competition between the redox-active sites, enhancing materials pseudocapacitive performance . Moreover, the highest surface area of the bismuth sulfide synthesized at the 75 °C among all samples provides the larger contact area at the electrode/electrolyte interface and facilitates ion diffusion during charging and discharging. The galvanostatic charge and discharge curves recorded at 1 and 10 A g−1 are depicted in Fig. 7a and b, respectively. The shape of curves suggests the faradic nature, which correlates with the CV measurements. The time of charge and discharge is noticeable longer when bismuth sulfide was synthesized at higher temperature, Fig. 7a and b. The galvanostatic discharge profiles are characterized by the two plateaus, which correspond to the peaks in the CV curves, attributed to the faradaic reactions and hydrogen adsorption–desorption processes. Moreover, the fade of the discharge plateaus at a high current density is related to the insufficient intercalation of the electrochemically active material with the electrolyte ions. The specific capacitance values of bismuth sulfides determined from galvanostatic measurements performed in 6 mol L−1 KOH aqueous electrolyte were in the range from 498 to 611 F g−1 at a current density of 0.2 A g−1, and exhibit an increasing trend along with the synthesis temperature. The highest capacitance values were measured for Bi2S3-75°C in the whole current densities and scan rates range, Fig. 6. 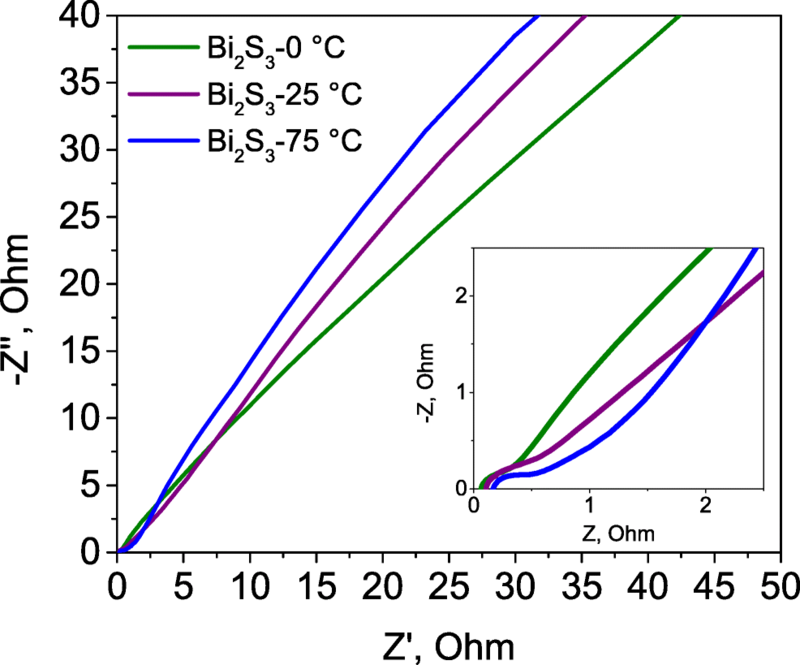 Moreover, bismuth sulfide obtained at 75 °C presented one of the highest capacitance value among other reported Bi2S3 and Bi2S3-based composites synthesized via different methods, Table 2. Bi2S3-75°C was characterized by the two and three-fold higher capacitance of 235 and 143 F g−1 at 10 and 20 A g−-1, respectively compared to Bi2S3-0°C which was only 117 and 59 F g−1. The best electrochemical performance of Bi2S3-75°C can be related to the most developed BET surface area and mesopore volume among all samples, Table 1. Moreover, uniform morphology of Bi2S3-75°C nanorods with a superficial spherical nanoparticles is beneficial for achieving high capacitance values and providing better electrode/electrolyte interfacial contact . Electrochemical impedance spectroscopy spectra of bismuth sulfides synthesized at different temperatures are shown in Fig. 8 in the form of a Nyquist plot. A very low ESR value at 100 kHz noticed for all of the tested materials of 0.24, 0.29, and 0.10 Ω for Bi2S3 obtained at 0 °C, 25 °C, and 75 °C, respectively, can be ascribed to their good conductive properties. A semicircle in the high-frequency region is observed for all samples, indicating fast ion kinetics due to the crystalline structure. The most inclined line towards – Z axis for Bi2S3-75°C indicates the lowest Warburg resistance among all samples, which is related to the ability of the electrolyte ions to penetrate into pores of the electrode material. The more horizontal lines of Bi2S3 from 0 and 25°C suggest difficulties of ion transport into the bulk material . The relationship between power and energy densities in the form of Ragone plot is presented in Fig. S1. The achieved energy densities of the synthesized bismuth sulfides are in the range from 7.6 to 6.2 Wh kg−1 at power densities from 24 to 32 W kg−1. In comparison, commercially available supercapacitors based on organic electrolytes deliver around 2–6 Wh kg−1 of energy . At higher power density above 3 kW kg−1, a significant decrease of the stored energy is observed for the Bi2S3 from lower temperatures due to the capacitance fade. The highest energy density is maintained by Bi2S3-75°C, presenting 2 Wh kg−1 at a power density of 2.9 kW kg−1 in an aqueous electrolyte. For further investigation, the cycling performance of the synthesized bismuth sulfides by the galvanostatic charge-discharge tests at a current density of 1 A g−1 has been performed (Fig. 9). The capacitance fade of the electrode material observed under cycling can be ascribed to mechanical stress due to the reversible insertion/de-insertion of electrolyte ions into the bulk material . Moreover, the spherical nanoparticles at the surface of the nanorods may aggregate during cycling, leading to the decrease of the amount of active sites available for the redox reactions. Bismuth sulfides obtained at 0 and 25 °C revealed comparable capacitive performance after cycling, presenting 128 and 141 F g−1, respectively. Among all samples, the Bi2S3 obtained at 75 °C maintained the highest initial capacitance value after 1000 charge–discharge cycles, achieving 236 F g−1. 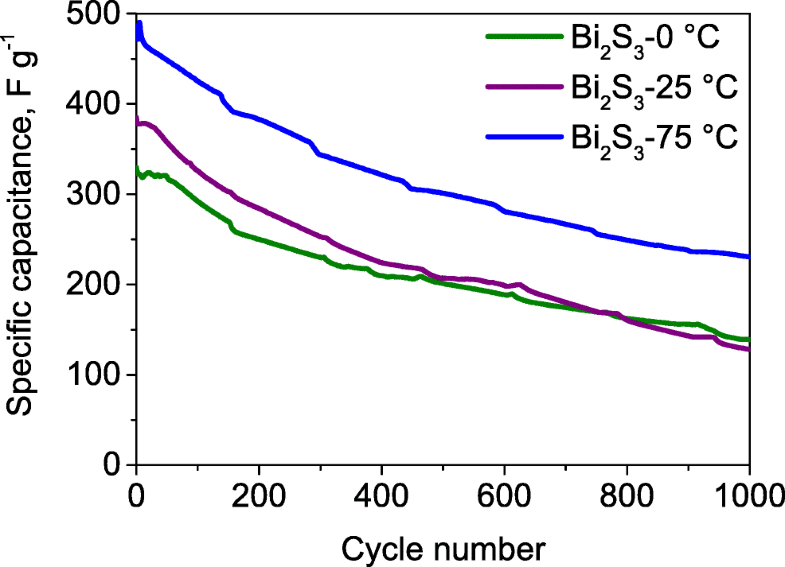 The porous structure and unique morphology of Bi2S3-75 °C in comparison with bismuth sulfides synthesized at 0 and 25 °C resulted in an improved electrochemical behavior, both in terms of the capacitive performance and cyclic stability. Bismuth sulfides in the form of nanorods were successfully synthesized via facile chemical precipitation method. Despite the temperature range, all materials present similar crystalline structure. N2 sorption analysis shows the largest mesopore volume for Bi2S3 prepared at 75 °C. Although the bismuth sulfides present low specific surface areas, neglecting the contribution of electrical double-layer capacitance, they exhibit high specific capacitance values from 527 to 739 F g−1 at a scan rate of 1 mV s−1 in a three-electrode cell, which confirm their faradaic behavior. Among all synthesized sulfides, Bi2S3-75°C was characterized by the best electrochemical performance, achieving capacitance value of 457 F g−1 at 1 A g−1 and a three-fold higher capacitance at 20 A g−1 in comparison to bismuth sulfides obtained at lower temperatures. The outstanding electrochemical performance observed for Bi2S3 synthesized at 75 °C is a result of uniform, nanorod-like morphology with a spherical nanoparticle thin film, which increased the ratio of the electrochemically active redox sites. Moreover, Bi2S3-75°C exhibited the most developed porous structure among all synthesized bismuth sulfides, facilitating the electrolyte ions movement at the electrode/electrolyte interface. The research leading to above results has received funding from the National Science Centre (Poland) under the grant agreement 2016/21/D/ST5/01642.